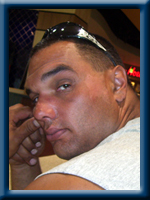 HANSON – Stephen Darin 42, of Liverpool, passed away suddenly in QEII Health Science Centre, Halifax on Monday, March 3, 2014. Born in Liverpool, he was a son of the late David “Sonny” and Joan (Roy) Hanson. Darin worked hard to provide for his family and was well-known for his outgoing, warm, joyful laugh as well as his willing and helpful personality. He loved hunting, fishing and spending time with his family and friends. He is survived by his wife and partner of 11 years Amanda (Conrad), his daughter Kelsey, his sons Jonathan and Darian, all at home. His sisters Crystal (Randy) Wamboldt and Tanya (Chad) Whynot, both of Liverpool. His brother Danny of Milton. His parents-in-law Allen (Debbie) Conrad of West Berlin, sisters-in-law Tracy (Arron) Carrier of Liverpool, Carrie (Tom) Hutchison of Florida, many nieces and nephews and cousins. His extended family Robert (Joley) Laing of Lower Sackville, Stephen (Amy) Rasley of Liverpool and his church family of the Salvation Army. He was predeceased by his brother David. Dairen’s personality will always be with you and will always be watching over the family. He will be missed by so many. Hugs & kisses. I am extremely sorry to hear of your loss. May time heal all your pain. Find comfort in each other, share the memories you have of darin and remember all the wonderful times you all had. My deepest sympathy is being sent. So sorry to hear about your loss . Our thoughts and prayers are with you and your familys. We are so sorry to hear about your loss hon . Our throughts are with you every step off the way. May you rest in Peace Dairen. Praying for Amanda & the Family . Amanda and Family. So Sorry for your loss, our prayers and thoughts are with you at this sad time. Darin may be gone in body but his spirit will always be there watching over all of you . we are sorry to hear of the passing of your loved one.our sincere sympathy to the familyour thoughts and prayers are with you all at this difficly time. sorry to hear about Darin he was a well known man.he loved his family very much he will be missed by all.take care Amanda and family.RIP my friend. Amanda, (children and all other members of Darin’s family and friends) we are so sorry to hear of your loss. Such a tragic event can only be explained as God must have had another calling for him. Rest in the knowledge that he is with our Lord now! To all of Darin’s family….we are so sorry for your loss…life just isn’t fair sometimes and this is one of those times…God must of had bigger plans for Darin…remember him for the caring and loving person he was…and his smile could light up a room…keep his memories close to heart and they will bring you comfort in the days ahead…spread your wings and Fly High with the Angels…R.I.P. Darin! We are deeply saddened by your sudden loss.. Our hearts go out to you our prayers are with you. May God comfort you and your family. Amanda and family, Crystal and family, Tanya and family, Danny and family, I am so sorry for your loss. Darin was a good young man who was always smiling and always had a hello. I’m sure his Mom & Dad has welcomed him into their arms. My thoughts and prayers are with each of you. Bless you all. So sorry to hear of your loss Amanda and family.What we knew of Darin was that he was a good man and father.God bless you and your family. Amanda I was so heart broken when I heard the news of Darin. There are no words I can say to make it easier for you and the family. Cherish all the memories and they will comfort you in the days ahead. It is not an easy road to travel but with god by your side you will make it. Crystal and family my heart aches for you all. My thoughts and prayers are with ALL of Darins’ family. God bless you all! you and give you strength in the days ahead. We have know Darin for many years he was a great guy .We send our prayers for peace in the hearts of his family and friends . Crystal and Randy, Amanda and family, Tanya & Danny & families, so sorry to hear of the loss of Darin. Darin always had a smile & minute to talk & always made you feel like you knew him forever. He is now at a place, where all troubles, sickness, pain are no more. I pray that God will give you all, the strength to get through this valley. We send our deepest condolences God Bless.. So sorry to hear about your loss . So sorry to hear of the loss of Darin.. Our thoughts and prayers are with the family and friends at this very difficult time. To all of Darrin’s loved ones: I hope that you can take some measure of comfort in knowing that our community shares in your grief and sorrow and lends its’ shoulder of support to lean on during this extremely difficult time.Darrin’s presence will be greatly missed by all who knew him.He had such an engaging smile,endearing laugh,and out-going personality,he was one of those rare people that you just couldn’t help but instantly like. I greatly admired his enormous pride in his family,especially the children,and it is in them that his legacy will live on. God bless and Rest Peacefully Darrin. Hanson family: We were sorry to hear about Darin. Our thoughts and our prayers are with your family. I’m so sorry for your loss Amanda (and family) May god bless you at such a sad time. May Darin rest in peace! We are very sorry for your terrible loss. Thinking of you and your family. We are saddened to hear of your great loss. Please accept our condolences. Take comfort in the many memories of him. So sorry to hear if your loss of Darin. We are praying that the Lord will comfort and reassure you at this difficult time. So very , very sorry for your sad loss. Please except our most sincere condolences. Hoping it helps to know that others care, Hugs to the children, take care and cherish the memories. We are sincerely lost for words, just know that we are thinking of you at this difficult time..cherish all those precious memories. We are so sorry for your loss. Thinking of all of you with heartfelt sympathy. So sorry to hear of Darins’ passing. It is such a young age to be taken from the ones that loved and knew him. He always had a smile and a few words whenever we met. He will be sadly missed. My thoughts are with you at this difficult time. We are so sorry for your loss. May all the special memories you made help you thru this difficult time. Hanson family,I am so shocked to here this my prayers are with you…god bless and you are strong and you have a strong family..take care…sending you a big hug ..take care.. I am so sorry for your loss. Just finished looking at the video and Darin looks like a man who loved his family and enjoyed his time with them. My thoughts and prayers are with you. There are no words that can take away your sadness and pain, but take comfort in knowing the entire community and abroad mourn with you. Debbie, Allan and family; Just learned today the news of your son-in-law and wish to express my sincere condolences to all of you. A very sad happening. I do not know your daughter but I feel so bad for her and the children. May God watch over them. Its breaks my heart whenever i think that hes gone…he was such a loving and caring person… I personally knew him from childhood from being a close friend to my moms..and he was there for me threw rough Times thanks buddy for that love Ya and miss Ya.. My condolences goes out to the family during this rough time. To the Hanson Family and the Conrad Family….So very sorry to hear of the loss of your beloved husband, father and brother. Please accept our sincere sympathies in his passing. Clarke remembers him coming into the Home Hardware Store and said what a real nice fellow he was, always smiling and always polite. So sad to hear. Thinking of you all. To Crystal,Danny,Amanda,and families.I am so sorry this has happened to Darin.Growing up with you and helping to look after you when Aunt Joan passed away was a pleasure.I know I haven’t kept in close touch,but this came as a real shock.My prayers are going out for all of you. So sorry for your loss. I can remember him as a child living just up the road from us. Can’t believe he is gone. Our prayers are with you. I am thinking of you all at this sad time .I am sending my thoughts and prayers to you all at this time. Amanda please know my heart and thoughts and prayers are with you god bless you all . Rest in peace in fair winds and calm seas to our fishermen Darin amen and god bless. Amanda, Allen, Debbie and Families: We were so saddened to hear of your tragic loss. May your faith help you to deal with the pain you must all be feeling at this time. We will hold you in our hearts and prayers. God Bless all of you. No words can express the sorrow we feel for the family. our condolences to all the family,such a tragic loss. So sorry on the loss of your loved one. My prayers are for the family at this sad time. Amanda, Danny & Tanya and families of Darin…So sorry to hear of Darin’s passing he had a smile and hello for everyone he will be greatly missed; he is now home in the arms of his Mom and Dad. Our deepest sympathy to all. To the Hanson and Conrad Families . So sad for this to happen to such a young family. Looking at the video Darin sure loved his family . Can’t help but think of you constantly of the sadness you are all going through . It looks you had lots of happiness Amanda in the short time you shared . Give the children lots of hugs . God bless you all . Brenda . So Sorry For Your Loss.Our Thoughts And Prayers Are With All Of You At This Sad Time. Please accept our sincere condolences on your tragic loss. Our thoughts and prayers are with you all at this most difficult time. David and I were so sorry to hear of Darins passing! Our thoughts and prayers are with you at this sad time! Cherish your memories they will help you and the children through this tragic time! I am so sorry for your loss. I remember Darin as a little boy at Port Mouton School, always pleasant with a smile. I remember the sadness we all felt when your family lost his mother. I am glad that Darin had the happiness of a loving wife and children , and the support of the Church. Rest in Peace, Darin. I was so sorry to hear about your loss. Darin was a wonderful person and he will be greatly missed by everyone. Our sympathies are with you and your family. Our prayers are with you. We are so sorry to hear of your tragic loss. Crystal and family, I am so sorry to hear the passing of your brother. I would see him and his young family coming into the Superstore all the time. I can never remember a time where he did not have a smile on his face or a chuckle of a laugh. He will be missed by everyone who knew him, it was a sudden shock to us all of his demise. Please know that he is everyone`s hearts and now in God`s hands. Bless you all. Darin will be sorely missed. I remember him as a student, a neighbor, and a friend. The world has lost a shining light. My heartfelt sympathies go out to his family. Darin worked blueberry fields in the back woods of Shelburne County for more than 12 years. I was introduced to Darin by his father Sonny who had worked the farm for years before that. Darin, my father Vernon, and my brother Allan, all lived and worked from a woods camp year round, busily clearing the land and working the fields during that time. Sonny was happy to see Darin working with us because he could work, hunt, fish, and spend more time in their mutually favorite environment… the back woods. When Sonny was about to die the last thing he asked of me was “Would watch over Darin” and “Keep an eye on him” and “Protect him” from harm. Sonny I hope you forgive me for failing you in this regard. Darin i pray God will reunit you, your mother, and your father in heaven. Darin may your soul rest in peace and may God bless the family you left behind. We were saddened by the loss of such a young man that was full of life. Our thoughts and prayers will be with you all as you grieve for Darin. Thinking of you. I just heard of Darin’s passing and wanted to send my condolences to his family. I have known Darin for 25+ years and he was always sweet with not a bad thing to say. He always had a smile to offer even when things seemed really bad. After I left Prince Rupert, Darin and I lost contact but through the magic 😉 that is FB reconnected intermittently, and again, his happiness shown through during the few conversations we had. No words can help with the loss you feel now, just know, you are in my prayers and he was loved by many people throughout his life. So sorry to hear about your loss. He was one of a kind and a very hard worker to support his family and to make sure they had everything that they needed. He will be well remembered and missed by a lot of family and friends. You always knew if darin was around because he had one special laugh. Try to keep strong I know it is hard at a time like this. Thinking of you Amanda and your 3 children and all of the other family and friends. If you need anything and I can help you I would be more than glad to do it. Take care. Rest in peace darin you will never be forgotten. Soo sorry for your loss, he was a great person soo kind and warm and funny. He will be missed. I miss you so much daddy every time I read this I can’t help but cry RIP my angel <3 <3 I will miss you until the day I die and love you forever.